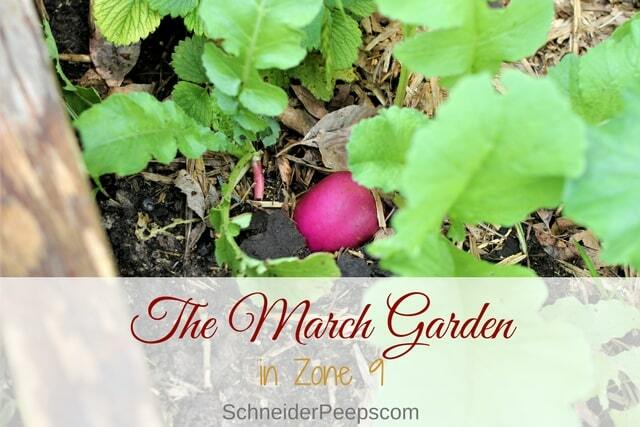 The March garden in zone 9 is usually full of a lot of summer seedlings with some hang over plants from the winter garden lingering on. It’s a great time. Not a lot is being harvested, but oh there is so much potential. 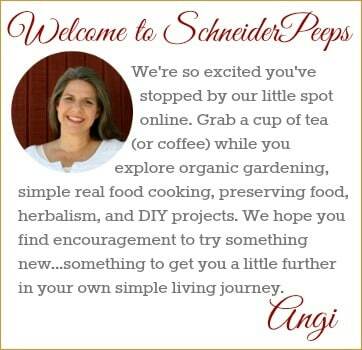 I love doing these monthly(ish) updates and showing the good and the not so good in my garden. I could just take really close up photos and give the appearance that it’s all lovely in my garden. But that isn’t reality and I don’t think it’s very encouraging. Gardening is a journey not a destination. For the most part we had a really warm winter with the exception of one weekend in January. That weekend we got down to 17°F…twice. We lost some of our fruit trees and quite a bit of our winter garden. But some trees loved the cold snap. This our citrus orchard, or what’s left of it after the freeze. 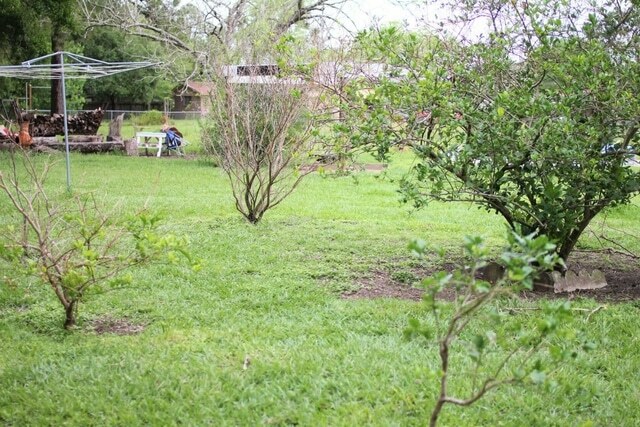 We lost our key lime, satsuma, polmello and sweet orange trees. Our Meyer lemon trees and the grapefruit tree survived. Normally they have flowered by now, but there isn’t a bloom on any of them. So we may not get citrus harvest this year. 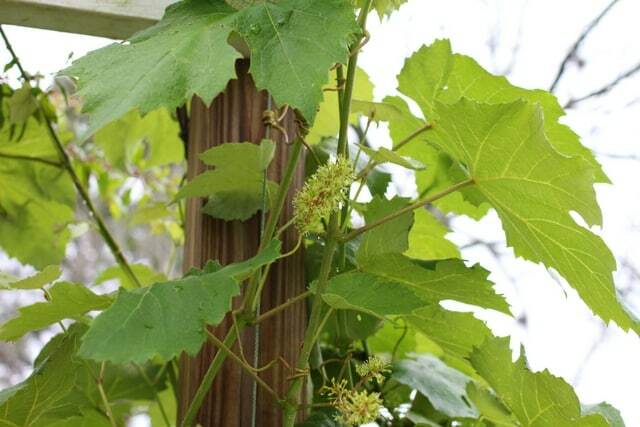 We lost one of our four grape vines in the freeze. The three that survived are doing well and one is already blooming. These are supposed to be table grapes but last year, our first harvest, the grapes were bit sour. I’ve been doing a bit of research as to why this might be the case. If you have any thoughts, I’d love to hear them. The fig tree is one that seemed to love the cold snap. It lost all it’s leaves from the freeze but within days has new leaves budding on it. It’s already fruiting which is earlier than normal. This variety can produce two harvests if the season is long enough. This early fruiting makes me hopeful we’ll have two harvests. I’ve been trying to keep notes on things I observe (like when the trees fruit or flower year year) in my gardening notebook. 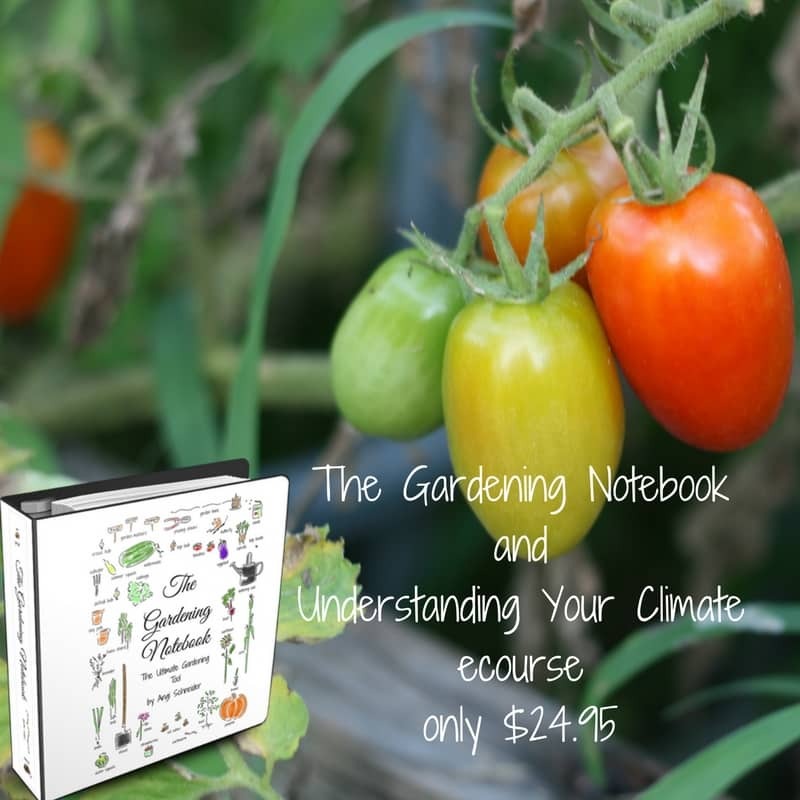 One day it will be my personal “farmer’s almanac” since I’ll have notes on patterns to help me plan each season. 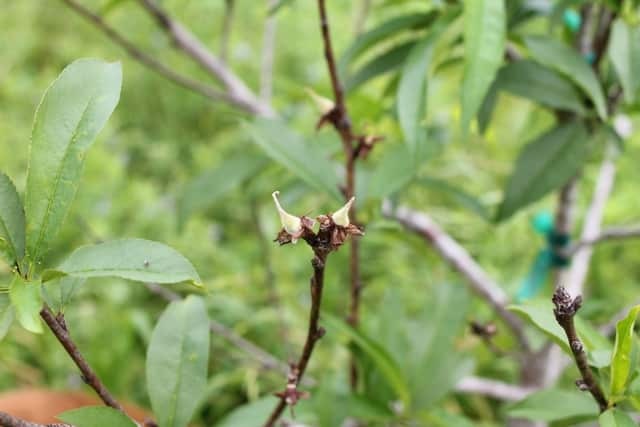 The peach tree also seemed to love the freeze and is already fruiting. We lost all our peach trees a couple of years ago and replaced them with a self-pollinating peach tree and nectarine tree. This will be our first harvest. The mulberries are such a treat right now. Each day a few more are ripe and we go out and do a little berry picking. 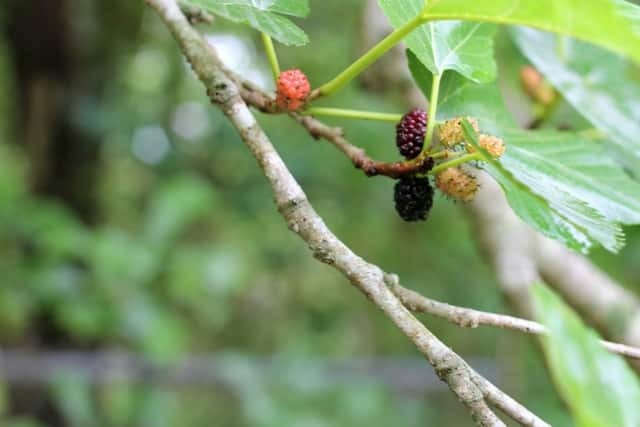 If you don’t have a mulberry tree, you should consider it. 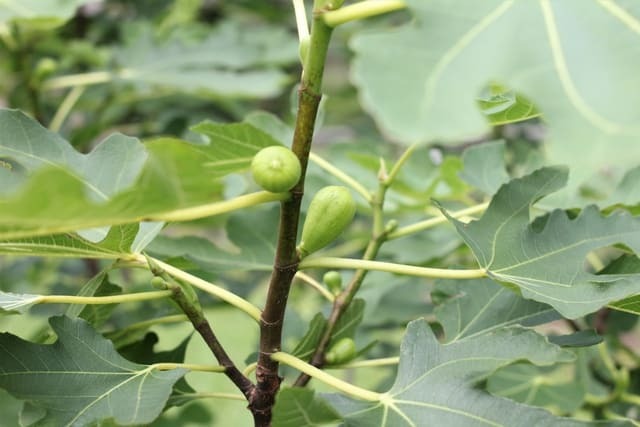 They are easy to care for and some of the earliest producing fruit trees. 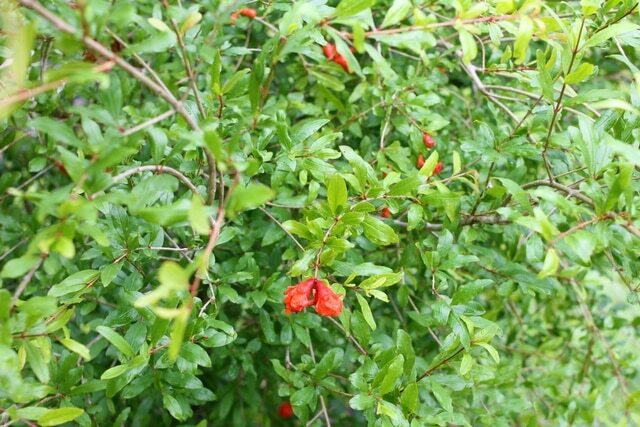 I don’t know if it’s from the cold snap or because it’s now five years old, but our pomegranate tree has more blooms that we’ve ever seen on it. Last year we only harvested one pomegranate, hopefully we’ll have a larger harvest this year. 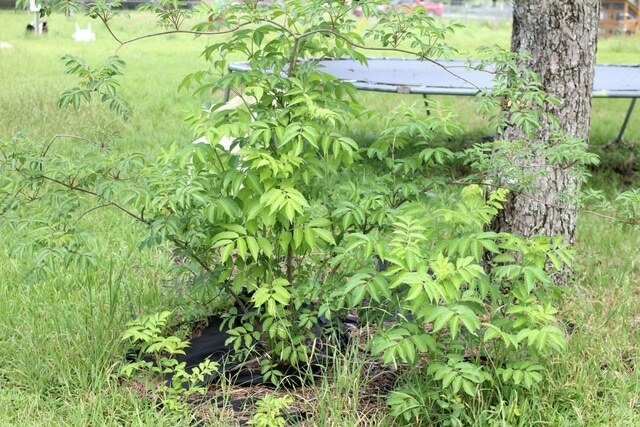 This is the elderberry tree we planted last year. I had no idea they propagate from the roots. 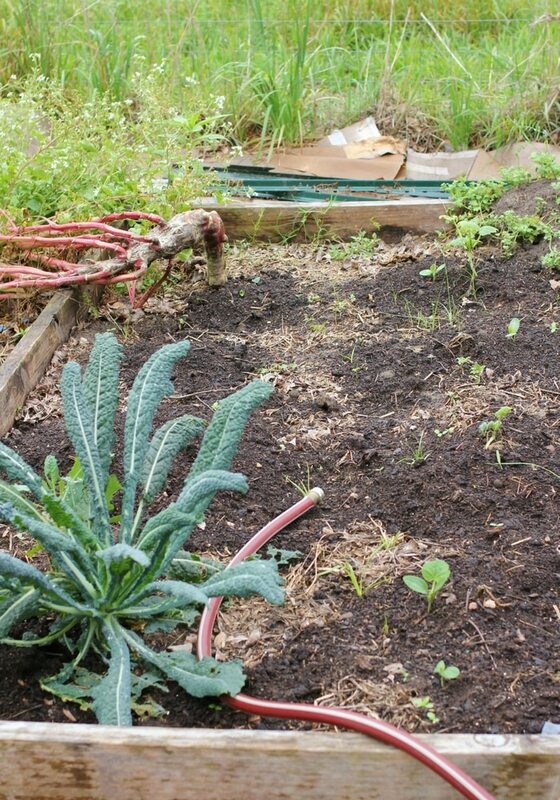 It’s sent up several new shoots, so we’ll be enlarging this area and planting using some permaculture and food forest methods. I’ll be adding milkweed, comfrey, borage and red clover. 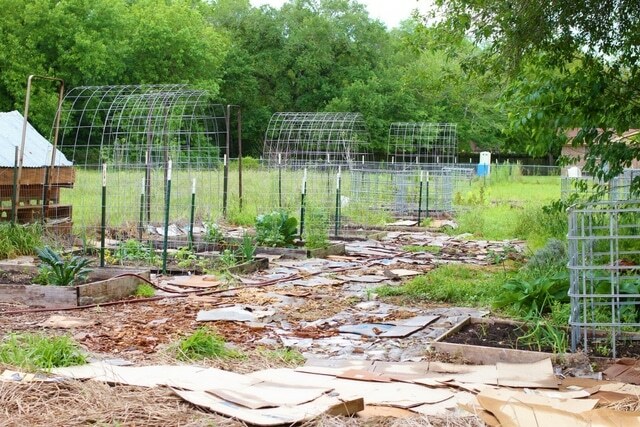 This is a wide view of our actual garden. I know it looks trashy, however, we have a plan. We’ve been laying down cardboard in the walkways to suppress leaves and it’s working great. However, we’re struggling to produce enough woodchips to cover the cardboard. See, gardening is a journey. This is part of the official herb garden. 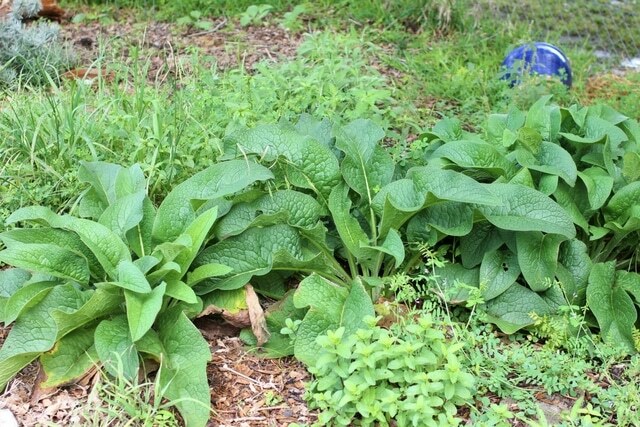 There’s some weeds that need to be cleaned out but the comfrey is doing great and I’m hoping that I can actually grow a large patch of mint this year. I must the only one in the world who struggles to grow mint. 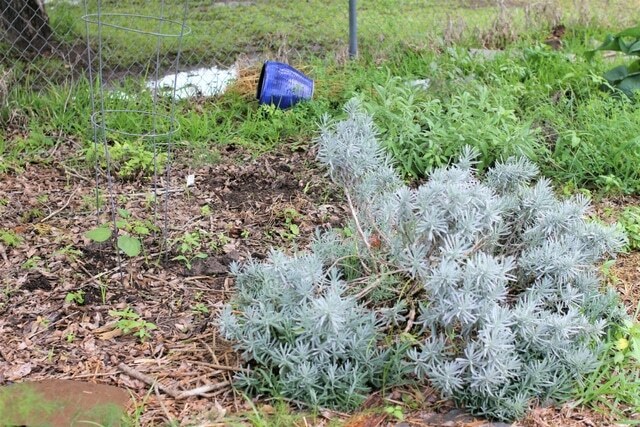 On the other side of the herb garden is sage and lavender. 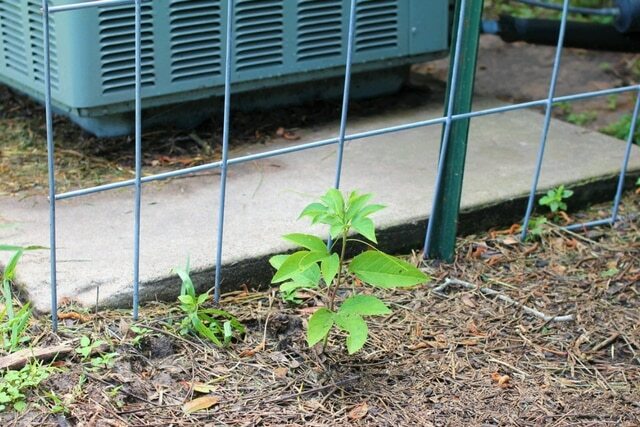 I also planted some edible hibiscus for the first time. We love hibiscus tea. This is what’s left from our winter carrots. I sowed some melon seeds in this bed. The carrots will all be harvested before they get very big. 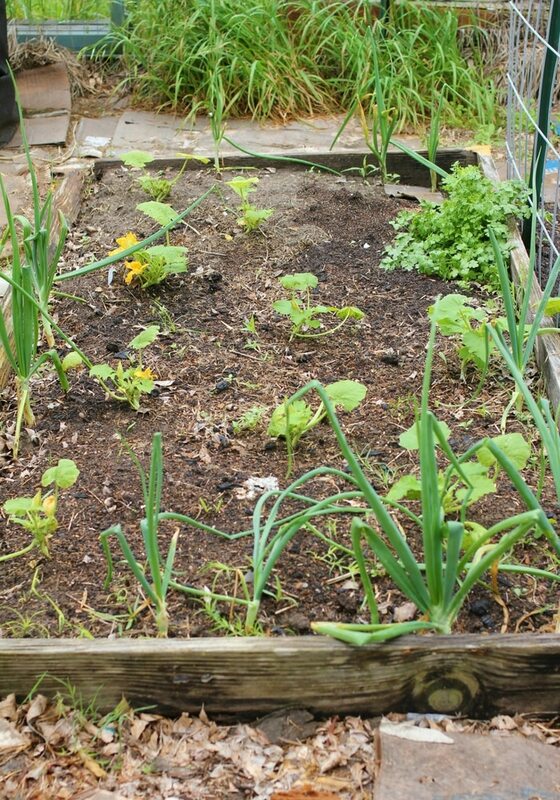 This is how most of our beds look in March. We have one last kale plant (the only one that survived the freeze), a large flowering radish and some yellow squash seedlings. 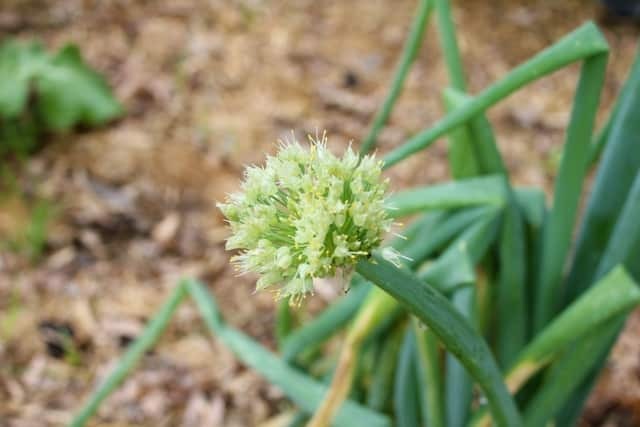 Our repeater onions are going to seed. I just let them go and reseed themselves. The bees love them and it’s one less thing I need to plant. Our zucchini is already flowering. I planted bulb onions around the perimeter to help ward off pests, we’ll see if it works. 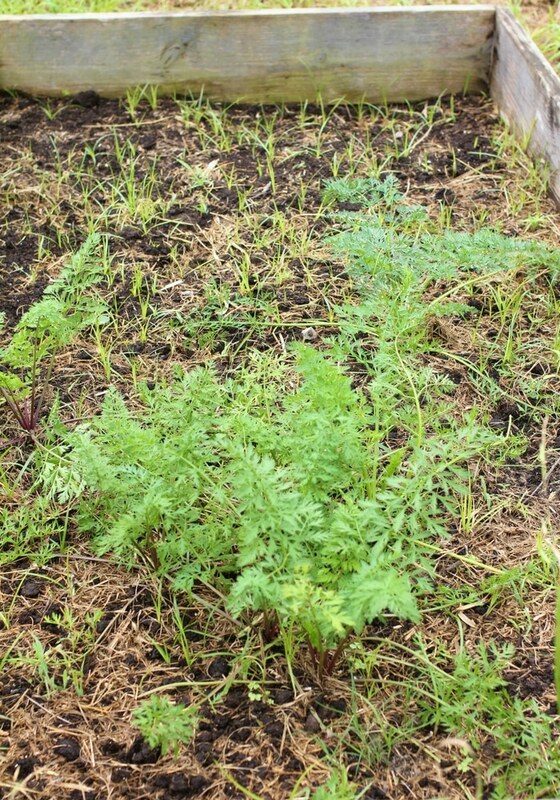 We also have several volunteer cilantro patches. 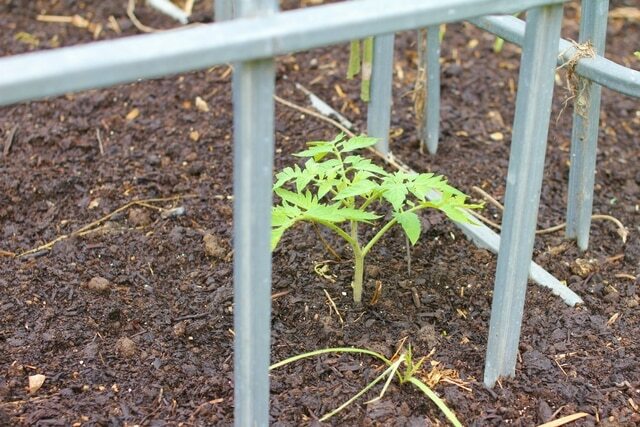 We planted our tomato seedlings in the garden last week and they are doing really well. 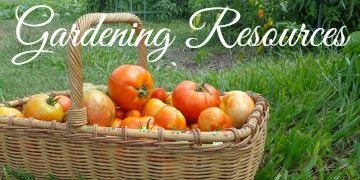 We’re growing fewer tomato plants this year and fewer varieties. I’m hoping that with fewer to water, I can care for them better and get a better harvest. We’ll see. Last year my husband brought home a passion flower vine and we planted it with the grapevines. It did well, and it fruited. We love passion fruit. This spring a lot of volunteer passion flower vines have been popping up in our yard, so we’ve been relocating them to the fence line. We also put up a cattle panel arch over our a/c unit and relocated some of the volunteer passion flower vines to fill it. 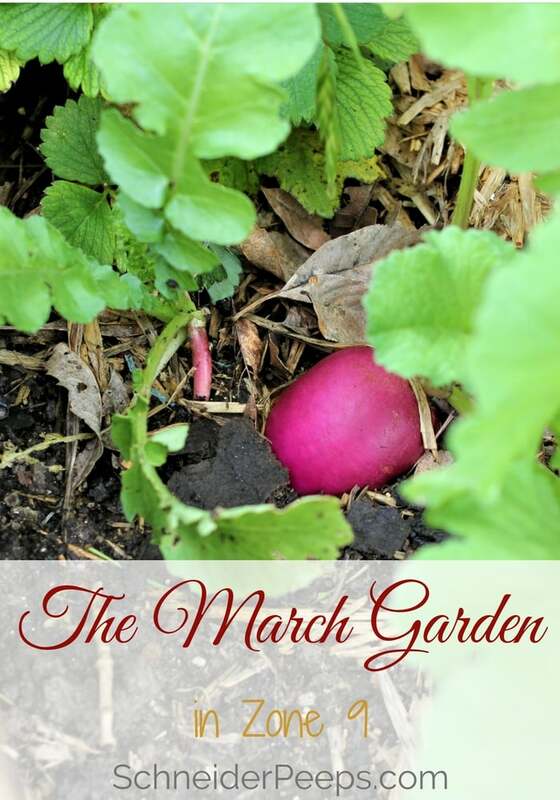 What’s going on in your March garden?